Tamron has announced two new teleconverters, designed to be used with select telephoto Tamron lenses, starting with the company’s new SP 150-600mm F5-6.3 Di VC USD G2. The 1.4X and 2X converters are moisture and dust-resistant, and turn the 150-600mm into a 210-600mm or 300-1200mm equivalent zoom, respectively. Both teleconverters use Tamron’s BBAR (Broad-Band Anti-Reflection) coatings to reduce ghosting and flare, and the 2X converter uses a low-dispersion element to suppress aberrations. The 1.4X and 2X converters will cost $419 and $439 respectively. They’ll be available in Canon and Nikon mounts starting September 23rd in Japan, with availability in the US soon after. September 1, 2016, Commack, New York – Tamron, a leading manufacturer of optics for diverse applications, announces the launch of two teleconverter models exclusively for select Tamron lenses. These accessories make it easy to expand the versatility of the new SP 150-600mm F/5-6.3 Di VC USD G2 (Model A022) ultra-telephoto zoom lens. TELECONVERTER 1.4x (Model TC-X14) increases the focal length by a factor of 1.4x, while TELECONVERTER 2.0x (Model TC-X20) doubles the focal length. Delivery of the new teleconverters, each available in Canon and Nikon mounts, will start on September 23 in the Japanese market and soon thereafter in the U.S. market at a price of $419 for the 1.4X and $439 for the 2X. Although the maximum focal length is increased, the minimum object distance remains nearly the same, so the magnification ratio during close focusing is enhanced. 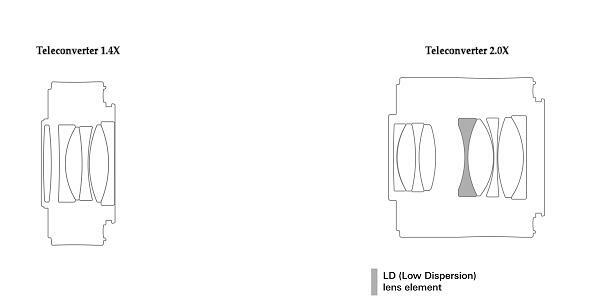 Both teleconverters are carefully designed and constructed to preserve the original superior image quality of the lens. The 2.0x model uses one LD (Low Dispersion) lens element to suppress aberrations. BBAR (Broad-Band Anti-Reflection) coatings are deployed on both models to help minimize ghosting and flare. Autofocus functions normally with compatible lenses (please refer to Compatible Tamron Lens List below). VC (Vibration Compensation) performance is maintained. The new teleconverters are ideal for use in outdoor photography when matched with any lens that has a Moisture-Resistant Construction because special seals that are dust-resistant and moisture-proof are used at every joint and seam. The barrel frame of the teleconverters are made of die cast aluminum, except for some parts of the exterior finish, to maintain extra strength when used with large lenses. The design utilizes a bayonet mount made of brass on the camera side and stainless steel on the lens side to ensure excellent durability even with repeated mountings and detachments. These accessories embody Tamron’s new design that’s born from the pursuit of functional beauty and achieved by smoothly blending engineering and design enhancements. Meticulous craftsmanship is applied to every detail. The new teleconverters feature a metal lens barrel and share this same design concept. Both teleconverters provide remarkable ease of use-even the release lever offers a comfortable touch to the photographer’s finger. *Use of the TC-X14 tele converter reduces the effective aperture by one f/stop. *Use of the TC-X20 tele converter reduces the effective aperture by two f/stops. Length is the distance from the front tip of the lens to the lens mount face. Entire Length is the distance between the tip of the lens and the tip of protrusion.